This Sunday marks the end of the NHL regular season with the final game in Minnesota pitting the Wilds vs. The Dallas Stars at 6PM ET. There have been many memorable moments this season including the HBO 24/7 series and hype around the 2011 Winter Classic featuring Alexander Ovechkin vs. The Washington Capitals against Sidney Crosby and The Pittsburgh Penguins. It has been an interesting season to say the least with the playoff race coming down to the wire for both conferences. Especially out West where only a handful of points separates fourth place from tenth place. The Stanley Cup Playoffs begin on April 13 and we can only hope they are as exciting as the race to get there has been. As you can see, the “event” games dominated the season. The Winter Classic and the All-Star Game took the top and third spots respectively. The Winter Classic has been a ratings hit since the tradition began in 2008 and is now rivaling the Stanley Cup finals in viewership. Missing from the top ten list is the Heritage Classic. 2011 marked the first year of the Heritage Classic, but ticket prices haven’t quite matched those of the Winter Classic. The rest of the regular season games featured match ups of some of the NHL’s marquee teams. As expected, seven of the eight most expensive regular season games featured at least one Original Six team. The most popular of which being the Toronto Maple Leafs. 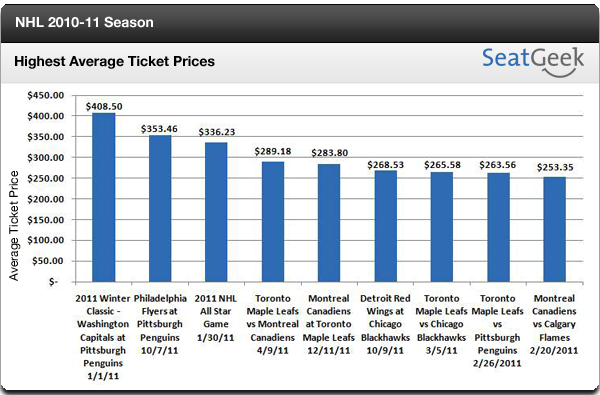 The Leafs dominated the list, playing in four of the nine most expensive regular season games. The second spot on our list went to the season opening rematch of the 2010 Stanley Cup Finals teams featuring the Pittsburgh Penguins vs. the Philadelphia Flyers. You can try to catch this years Stanley Cup champion at a discount by going to the early rounds of the playoffs. The matchups are all set for the 2011 Stanley Cup Playoffs and you can purchase NHL tickets on SeatGeek by following the links below.